As soon as we had dinner the young folks all went down to the depot with me. I had good company and the pleasantest trip I ever had up from Burlington. Arrived at nine oclock and found the folks had been well and hard at work during my absence. I had enjoyed my trip very much. Rob was to start in the evening for Creston. 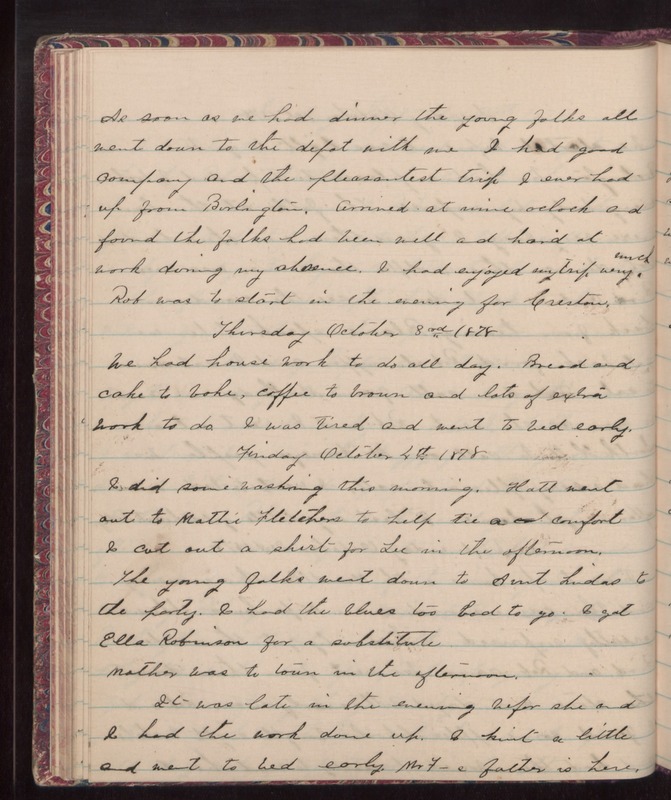 Thursday October 3rd 1878 We had house work to do all day. Bread and cake to bake, coffee to brown and lots of extra work to do. I was tired and went to bed early. Friday October 4th 1878 I did some washing this morning. Hatt went out to Mathi Fletchers to help tie a comfort. I cut out a shirt for Lee in the afternoon. The young folks went down to Aunt Lindas to the party. I had the blues to bad to go. I got Ella Robinson for a substitute. Mother was to town in the afternoon.